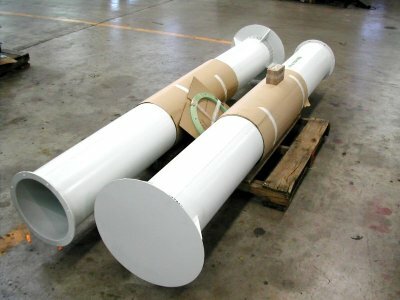 Sludge Tank Vent Ducts | Piping Technology & Products, Inc.
Sweco Fab, Inc. recently designed and manufactured sludge tank vent ducts for a development project in Chad, Africa. Due to the thin wall and height of the cylinder shell it was required to add a stiffing ring between the cylinder shell and flange. Each duct was 12 ¼” I.D. x 104 7/8″ high and weighed approximately 96 pounds. They were painted inside and out per System 6E grey color. Learn more about Sweco Fab, Inc. and it’s products by visiting our webinar archives today!